Biblical history comes alive at our full-sized Biblical Tabernacle reproduction. The Biblical tabernacle reproduction was created in the late 1940’s as the “Moses Tabernacle in the Wilderness,” by a Baptist minister in St. Petersburg, Florida. Mennonites later purchased the replica and eventually joined it with the Mennonite Information Center. For over 60 years this exhibit has been invaluable for students of Bible and cultural studies. Thousands of people visit the Biblical Tabernacle each year. The tabernacle replica is housed in a building with a contoured upward ceiling and an acoustically pleasing atmosphere. 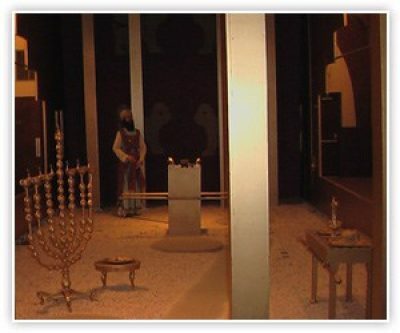 Presentation guides versed in the scriptural context and significance of the tabernacle and its furniture lead you in conversation from the Brazen Altar just inside the eastern gate of the courtyard to the Ark of the Covenant in the Holy of Holies. Even if you know little about Biblical history, this presentation is fascinating. But for those who know, this makes the story come to life. As you look into the Holy Place, a full-size, wax figure of the high priest presides over the altar of incense. His authentic robes have precious stones imbedded in gold on his breastplate. The Golden Candlestick, and Table of Shew Bread are made-to-scale. A fully researched design of the veil separates the people from the presence of God just like in olden times. Many people of different religious, ethnic and cultural backgrounds find this lecture tour of the Biblical tabernacle reproduction the high point of their visit to Lancaster County.